The event was hosted by Matavera and took place at the Takitumu School field. 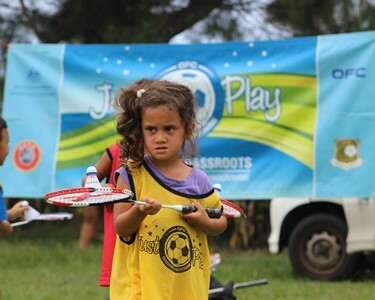 It attracted close to 90 children-a record high for the village of Matavera- joining in the Sport for Development Programme and enjoying the fun-filled activities that were provided by various sports codes. According to Project Manager Michelle Paiti, the large number wasn’t the only achievement made at the festival. Another important component fitting to the Day for Women’s theme, social messages by the Gender Division of the Ministry of Internal Affairs and the Ministry of Health were delivered during the festival. “We wanted to link in the issue of Gender towards the theme Pledge for Parity as we found it was appropriate,” says Paiti. With the growing interest of the Programme amongst the community Paiti was thrilled to see the remarkable support received by parents who are now joining their children at the festivals. Joining in the festival for the first time was big sister Tabitha-Berg who brought her partner’s 4-year-old brother along to the event. Realising what the programme was all about Berg returned with her brother. Impressed by the programme Berg will be following the festival around the island. “I think it’s a great programme offering a variety of activities kids can enjoy and also benefit from. We would like to acknowledge the continued partnerships of the various sporting codes and ministries involved with the Village Festivals. The next village festival will be held next month and hosted by Titikaveka. Further details will be advertised closer to time.